On February 10 2009, John Wyatt rushed to the hospital when his girlfriend went into labor, excited to meet his new baby girl. The couple was 19, but he says he couldn't wait to be a dad. When Wyatt arrived at the hospital, though, his girlfriend was already gone. "Colleen was being snuck out the side exit maybe like 50 feet to my left," he told the 'Today' show. The young mom gave the baby up for adoption without his consent. Almost three years later, Wyatt is still fighting to get his daughter back. Her nursery is set up and ready for the baby he calls Emma to come home. Right after the baby was born, Wyatt hired a lawyer in Virginia to seek custody of his daughter. What Wyatt didn't know, was that the baby was already in Utah, 2,000 miles away. And although a Judge in Virginia granted him temporary custody of his daughter, Wyatt says he never got her back. Under Utah law, he only had 20 days to file for custody -- a deadline that expired before he even was aware that his daughter was in Salt Lake City. In July, Utah's supreme court ruled against Wyatt, saying he failed to exercise his parental rights. The Utah Attorney General said, "In a situation where the birth mother who carried that child for nine months and has made a decision that is in the best interest of her child to go to an adoptive family, that we ought to have the same interest in the father, he ought to have to step up and show the same type of commitment to that child to resolve that." And, although his daughter is almost three, he says he is never going to give up trying to gain custody. He does not think it is in the best interest of the child to stay with the only family she has ever known. The Utah Supreme Court on Tuesday rejected a Virginia father’s appeal to overturn the adoption of his daughter, a child known as “Baby Emma,” finding he did not meet required deadlines for asserting his parental rights. The justices also ruled John M. Wyatt was barred from arguing that the federal Parental Kidnapping Prevention Act required Utah to follow a Virginia judge’s order giving him custody of his daughter because he did not raise that argument in a lower court. Attorney Larry Jenkins, who represents adoptive parents Thomas and Chandra Zarembinski and their adoption agency, said his clients were declining interviews and had asked him not to speak about the decision because of a federal lawsuit still pending in Virginia in which Wyatt alleges he was fraudulently deprived of his parental rights. In Virginia, Wyatt said he was not surprised by the decision. Wyatt has said he opposed the adoption of his daughter, born Feb. 10, 2009 in Virginia and placed with a Utah couple days later through A Act of Love adoption agency, from the start. He had hoped to raise the child, either alone or with his then-girlfriend, Emily Colleen Fahland, who is the birth mother. Fahland relinquished her parental rights to her daughter on Feb. 12, 2009. Joshua Peterman, Wyatt’s attorney, argued a time-stamped receipt shows Wyatt filed visitation and custody petitions on Feb. 18 — five days before the Zarembinskis initiated an adoption proceeding in Utah. Wyatt also never received proper notice of Fahland’s intention to proceed with an adoption, Peterman said. But Jenkins claimed Wyatt didn’t comply with other legal requirements in either state. The high court sided with Jenkins and noted Wyatt did not file anything with Utah until April 28. “The district court correctly concluded that Mr. Wyatt failed to assert his parental rights in time in either Utah or Virginia prior to the birth mother’s relinquishment of her parental rights in [Baby Emma] and thus waived all rights to contest the adoption,” wrote Justice Jill Parrish for the court. Utah’s statute requires unmarried biological fathers to follow a strict time frame, regardless of where they reside or where a child is born, to preserve any right to object to an adoption. The biological father must show he did not and could not have known an adoption was being considered; begin court proceedings to establish his paternity before a birth mother gives consent for an adoption to proceed; and demonstrate he is fully committed to assuming his parental responsibilities, such as paying for pregnancy-related expenses. At least half a dozen unmarried biological fathers have waged unsuccessful efforts to stop adoptions in Utah. In one case, the court found a father was on notice when his pregnant girlfriend told him she was in Utah; in another, the court said a father failed to adequately show how he would provide for a child. In the Baby Emma case, the court for the first time reviewed whether a federal kidnapping law applied to an adoption proceeding. The kidnapping act’s primary intent is to prevent parents from state shopping in pursuit of more favorable child custody determinations. It includes rules designed to help govern which state has jurisdiction in a custody dispute — which Wyatt argued applied in the Baby Emma case and required a Utah judge to defer to a Virginia order granting him custody. A majority of justices agreed that since the federal act refers to “any proceeding for a custody or visitation determination,” it applies to adoptions; but it found Wyatt failed to make that argument in a lower court and thus couldn’t raise it in his appeal. In separate opinions, justices Ronald Nehring and Thomas Lee concluded that Congress did not intend the kidnapping act to apply to adoption proceedings. Lee said the federal law governs only custody and visitation rights in divorce cases, rights that can be modified over time. Adoptions, however, are final, Lee wrote. Peterman said since the ruling didn’t get to the merits of Wyatt’s appeal, it leaves unresolved how the federal kidnapping act applies in adoption cases. Peterman said he currently is representing three other biological fathers who are contesting adoptions. “This isn’t an isolated case, this is a pattern of cases coming through Utah,” Peterman said. UTAH COURT HAS STOLEN BABY EMMA!!! "People should be worried now because this gives adoption lawyers in Utah 'carte blanche' to go into any State in these United States and take any unmarried biological Father's baby. This is about the money-generating adoption mill that exists in the State of Utah. Every parent has a God-given right to raise their own child. Please write/email/call your Senators, Congressmen, TV, Newspaper and other media to bring awareness to Utah's corrupt adoption laws. This is unconstitutional! It will happen to another innocent baby and caring birth Father again. --but can't even get a visit. A Virginia father traveled across the country to fight for the daughter he's never met. John Wyatt headed to court Thursday stopping only to show reporters the cell phone photo of his daughter Emma. The Dumfries man has only seen photos of his daughter. She was adopted last year by a couple in Utah when Wyatt's girlfriend signed papers without John's permission. Thursday, Wyatt's attorney argued before the state supreme court that Emma belongs back in Virginia, which granted Wyatt custody. "I live in Virginia, halfway across the country, and they want me to comply with their laws when my state already said that I did everything to protect my rights," said Wyatt. SALT LAKE CITY — For more than a year, John Wyatt has fought for his daughter — for the right to see her, for the right to hold her. He hasn't had the chance to do either. "Baby Emma" was born in Virginia in February 2009 and adopted by a Utah couple a short time later. Since then, Wyatt has waged an uphill battle for custody in a state he says makes it too easy to strip fathers of their rights. "It's heartbreaking," he said Thursday outside the Utah Supreme Court chambers. "It's caused so much pain and stress. I think about her all the time. I will never give up on her. She is my heart. You can't live without your heart." Before Utah's high court Thursday, attorneys for both Wyatt and Emma's adoptive parents laid out the legal arguments in the case. A decision on who will raise “Baby Emma” may hinge on whether her father acted quickly enough to protect his rights in his home state, what deference Utah gives other state’s courts, and interpretation of a federal kidnapping law. The Utah Supreme Court focused on those issues Thursday as it heard arguments in John Wyatt’s bid to gain custody of his daughter, born Feb. 10, 2009, in Virginia and placed with a Utah couple days later through A Act of Love adoption agency. Wyatt has said he opposed the adoption from the start and hoped to raised the child, either alone or with his then girlfriend Emily Colleen Fahland. But Larry Jenkins, the agency’s attorney, said Wyatt acted too late in both Virginia and Utah to protect any legal claim to the child. Joshua Peterman, Wyatt’s attorney, said a time-stamped receipt shows Wyatt filed visitation and custody petitions on Feb. 18 — five days before Thomas and Chandra Zarembinski, the adoptive parents, initiated an adoption proceeding in Utah. Peterman characterized the case as a custody dispute that falls under provisions of the federal Parental Kidnapping Prevention Act. 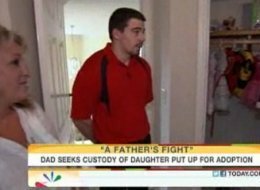 He said Wyatt did everything required to protect his parental rights under Virginia law, as noted by the judge there who granted Wyatt custody of Emma. The case of Baby Emma/Baby Gabrielle has Utah's adoption laws under national scrutiny. Taking Action 4 You, we spent the day investigating; What makes Utah's adoption laws different? Baby Emma or Gabrielle, depending on which parent you ask, is currently caught in an interstate tug-of-war. Her adoptive parents in Utah and her biological father from Virginia both are claiming the one and a half year old belongs with them. And while this case is unusual, pitting state against state and judge against judge, it's not unheard of. Especially in Utah. SALT LAKE CITY (ABC4 News) – A Virginia dad is in Utah hoping the legal system will allow him to bring his daughter back home. Thursday, the Utah Supreme Court will be asked to decide whether Baby Emma was legally adopted by a Salt Lake City couple or if she was kidnapped. “She was born on February 10th 2009," said John Wyatt. "(She was) eight pounds, six point eight ounces 21 inches long." But Wyatt has never held Baby Emma in his arms. She was given up for adoption by her birth mother without his consent. “It angers me that someone who knows what it's like to not have a child would do that to someone else who has a child and wants a child and have complete disregard for me knowing I wanted my child the whole time,” he said. A Virginia judge gave Wyatt custody of Baby Emma, but a Utah judge gave the adoptive parents custody. John Wyatt says this is the thought that keeps him going: One day, he will be with his daughter. Wyatt knows the daughter he calls Emma, now 18 months old, only through photographs. Since her birth in a Virginia hospital, he has waged a battle in two states to assert his right to have custody of Emma. The next round will take place Thursday before the Utah Supreme Court, where attorneys will argue adoption law, jurisdiction and, perhaps, whether a child is better off being raised by two parents than a single father. Wyatt claims Utah’s laws are unfairly aligned against unmarried biological fathers and that a Utah judge ignored legal decisions made in his home state and the federal Parental Kidnapping Prevention Act. Like Thurnwald, Wyatt believed that he and girlfriend, Colleen Fahland, would raise baby Emma together. He went to doctor appointments and spoke to the baby soothingly inside Fahland’s belly, with the belief that childhood connection to a father’s voice can begin before birth. Wyatt and Fahland, who have known each other since second grade and dated for about three years prior to the pregnancy, are still romantically involved, he says. While Fahland has declined all interviews with the news media, her attorney and Wyatt say she regrets her role in the adoption. On the day of the Emma’s birth, Wyatt and his mother arrived at the hospital for the delivery, but the hospital would not let them in. So-called “silent patient” privacy policies allow patients to have no information released about them. Wyatt knows what happened next only secondhand from Fahland and from court testimony. He says she was isolated in a hotel room and pressed by representatives of the adoption agency and her own mother to sign the relinquishment papers. “To me, it sounds like they took advantage of her,” Wyatt says. The Utah Adoption Council meets today for an annual retreat. I'm told by the president-elect Wes Hutchins that several issues related to unmarried fathers and their rights to their children that I exposed in this week's cover story will be discussed. "This is item number 1 on my agenda," Wes Hutchins told me on the phone yesterday, referring to, "Some Call It Kidnapping: How Utah adoption laws take babies from the nation's unmarried fathers." The Utah Adoption Council is a non-profit advisory committee that sponsors most of the almost-annual revisions to Utah's adoption laws. But it's not just Utah laws that Hutchins is excited to discuss with the rest of the council: he also wants to discuss Larry Jenkins, the lawyer/lobbyist who many of the men in my article blame more than anyone else for their predicaments. Not only is Jenkins the frequent legal representative for birth mothers and adoption agencies in these cases, but he's the legislative representative for the Utah Adoption Council and a registered lobbyist for two Utah adoption agencies. SALT LAKE CITY, UT (krcl) - Do Utah adoption laws discriminate against unmarried fathers? The City Weekly's Jesse Fruhwirth joins us to discuss his feature story, Some Call It Kidnapping. We're also joined by two fathers featured in the article, John Wyatt and Cody O'Dea who both lost custody of their children in Utah courts. John Wyatt raced to the hospital, excited to be a father but worried about the mother. His girlfriend had promised to call him the moment she went into labor, but she'd turned off her cellphone. Wyatt had been calling it for hours. Finally, an operator at Potomac Hospital in Woodbridge confirmed the news: His girlfriend was there, and his daughter had been born. When Wyatt arrived at the hospital that morning of Feb. 11, 2009, he got the shock of his 20-year-old life: Administrators insisted that no such baby was there -- and no such mother. Court records show that Wyatt's daughter, Emma, was born Feb. 10, at that very hospital, and that she spent the next week at two Woodbridge hotels before being put up for adoption -- in Utah. "We just want Emma to come home," says Wyatt's mother, Jeri. "My son wants his child. I want to see my granddaughter." More than a year later, a cross-country court fight over the child known as "Baby Emma" has yet to settle the question of whether the strawberry-blond-haired, blue-eyed girl was illegitimately taken from her father or legally put up for adoption by her mother, 20-year-old Emily Colleen Fahland, a George Mason University student. The highly unusual dispute pits Virginia against Utah; a Stafford County judge in December awarded Wyatt custody of Emma and cited a federal kidnapping statute in ordering the state to bring her back from Utah. Virginia officials say they lack the legal authority to follow the judge's order. In Salt Lake City, a Utah judge issued a competing order granting temporary custody to the adoptive couple in that state, and Emma has been living with them ever since. Lawyers for the couple say Wyatt failed to assert his parental rights in time to contest the adoption. His appeal is pending in a Utah court. "My daughter is being held hostage," says Wyatt, now 21, a D.C. nightclub worker who has never seen Emma. "She was kidnapped and cradle-robbed from me, and I'm baffled that nothing has been done." The case, which has been documented on the "Dr. Phil" show and is the talk of the nation's close-knit circle of adoption lawyers, is the latest to spotlight Utah adoption laws that experts say are unusually tough on unmarried fathers. Lawyers cite at least 10 recent cases in which babies were brought to or born in Utah and adopted without an out-of-state father's consent. In one case, the Utah Supreme Court last year ruled in favor of an unwed Wyoming mother who falsely told the father she miscarried, traveled to Utah to deliver the baby girl and put her up for adoption. "Utah risks becoming a magnet for those seeking to unfairly cut off opportunities for biological fathers to assert their rights to connection with their children," Chief Justice Christine Durham wrote in dissent. Joan Hollinger, a University of California at Berkeley professor and a leading authority on adoption law, called Utah's decisions in the Baby Emma case "outrageous" because Wyatt filed for custody in Virginia just eight days after Emma's birth. Utah laws and court decisions, she said, "make it virtually impossible for an out-of-state father to prevent the adoption of an out-of-wedlock child when the mother is determined to go forward." Utah is culturally conservative, and lawyers say the powerful Church of Jesus Christ of Latter-day Saints, with its emphasis on family values, has strongly encouraged adoption-friendly laws. "The Utah statutes can be harsh, but they are looking at what's best for the child: stable placements and two-parent families," said David Hardy, a lawyer for LDS Family Services, a Mormon Church-affiliated adoption agency that is among the nation's largest. The adoptive couple in Utah, Thomas and Chandra Zarembinski, could not be located, but their lawyer, Larry Jenkins, said the experience has been "gut-wrenching" for them. "They're the only parents this child has ever known," said Jenkins, who added that Emma "is doing extremely well." Emma's birth mother, Fahland, did not return repeated telephone calls. Fahland's lawyer, Sharon Fast Gustafson, said Fahland believed at first adoption "was the right thing for this child. She was single, planning to go to college, and she and the father did not have long-term plans." In recent months, Fahland has come to regret that decision, Gustafson said. Still friends with Wyatt, Fahland "sees this father who is wishing she hadn't done it," Gustafson said. Wyatt still remembers her from second grade. He and Fahland attended Saint William of York Catholic School in Stafford together, and they began dating in seventh grade. The relationship continued, off and on, through high school. The surprise pregnancy came in May 2008. "She started crying, but I was happy," Wyatt said. "My father died when I was 10, so I've always wanted to be there for my children." Wyatt argued vehemently against Fahland's decision to put the baby up for adoption. The couple talked of raising the child together and, eventually, getting married, Wyatt said. On Feb. 5, 2009, Fahland sent Wyatt a text message that has become central in the dispute. Wyatt recalls that Fahland texted him that she was "receiving information" from a Utah adoption agency. He immediately called her, and says she assured him they would make a decision jointly -- and that she'd alert him the minute she went into labor. In their final conversation, about 11 hours before the birth, Wyatt says Fahland vowed they would raise the baby together. Gustafson declined to comment on what Fahland said. In the Utah courts, Fahland told a different story. She filed a sworn affidavit saying she actually told Wyatt in the Feb. 5 text that she "intended" to put the baby up for adoption there. Jenkins said that gave Wyatt time to file a court action in Utah that could have allowed him to contest the adoption. "Frankly, he never did," Jenkins said. On the morning of Feb. 11, Wyatt awoke early and sensed something was wrong -- Fahland's cellphone had been off throughout the previous day. A few hours later, according to Wyatt and his mother, the switchboard operator at Potomac Hospital identified Fahland as a patient and said she'd delivered a baby girl. Shocked that hospital administrators later denied that, Wyatt called his mother. She raced to the hospital, too, and threatened to sue when the hospital told her the same thing. "They were hiding this baby from us," Jeri Wyatt said. "They looked us in the eye and said there was no baby or birth mother there." Charlene Wilkins, a spokeswoman for the hospital -- now called Sentara Potomac Hospital -- declined to comment, citing patient confidentiality and the legal dispute. The hospital has not been sued. In documents given to Wyatt's lawyers during pre-trial discovery, Fahland said Emma was born at Potomac Hospital at 11:02 a.m. on Feb. 10. Fahland and the baby spent Feb. 11 and 12 at the Fairfield Inn in Woodbridge along with an employee of A Act of Love, the Utah adoption agency, court documents show. Fahland signed the adoption consent forms Feb. 12 in the presence of that employee, Laraine Moon. The agency did not return telephone calls and it's unclear how or when the agency got involved with Fahland. Court records show the Zarembinskis then cared for Emma at an unnamed hotel in Woodbridge before flying her to Utah. On Feb. 18, Wyatt sued for custody in Stafford County Juvenile and Domestic Relations District Court. His lawyer had officially learned of the baby from Fahland's lawyer. "I found out I had a daughter through word-of-mouth," said Wyatt, whose name is on Emma's birth certificate because Fahland later agreed to add it. In his December order granting custody, Judge Gerald F. Daltan said that since Wyatt is Emma's "acknowledged father" and had sought custody five days before the Zarembinskis filed adoption papers in Utah, Emma could not be adopted without his consent. He called Wyatt "a good and decent person" who is fit to raise Emma. And the judge had fighting words for Utah. He ordered the Virginia Department of Social Services to cause Emma's "immediate and forthwith return" and said Utah "cannot be considered the home state of the child" under the federal Parental Kidnapping Prevention Act. Utah disagrees. A judge in August granted the Zarembinskis temporary custody of Emma while the adoption proceeds. And the same judge ruled that Wyatt cannot object to the adoption, partly because he failed to move quickly enough to assert his parental rights under Virginia law -- even though the Virginia judge said he had. "That's the problem with this case," said Wyatt's Virginia lawyer, Stanton Phillips. "Virginia does one thing, and Utah does something else and thumbs its nose at Virginia. Since the child is in Utah, John is really stuck." The Utah Court of Appeals will hear arguments May 24; if Wyatt loses, his remaining legal options would be the Utah Supreme Court and the U.S. Supreme Court. In the meantime, Wyatt and his mother are pushing the Virginia social services department to enforce the Stafford judge's order. A department spokeswoman, Marianne S. McGhee, said the Virginia Attorney General's Office concluded that though "the circumstances are troubling, the fact is that the Virginia Department of Social Services cannot interfere with a biological parent's right to place a child for adoption, unless there is a suspicion of abuse or neglect." Still, Wyatt fights on. "The only thing that keeps me going," he said, "is knowing that one day I will get to see and hold my beautiful daughter."